Part 1 offered an overview of the entire paper and what to expect in coming blogs. Part 2 gave a detailed account of various coating application methods. Part 3 will wrap the series up with design considerations in hot melt application systems and offer a brief conclusion. There are many factors that go into the proper design and fabrication of a coating application system. When designing a system for the application of hot melts, these factors are complicated by the requirement that the system operate at elevated temperatures. This is of particular concern when considering the accuracies and tolerances of the coater and its parts. The system must be designed to maintain its accuracies throughout the entire range of operating temperatures. In order to accommodate this temperature range, it may be necessary to select special materials for construction that are conducive to maintaining dimensional stability at elevated temperatures. In certain applications it may be necessary to grind parts, such as coating rolls and knife coater blades, at the operating temperature to assure their accuracies under running conditions. The selection of bearings with the proper clearances to allow for operation at the elevated temperatures is also a major consideration. Care must also be taken to ensure that thermal expansion of parts is considered. Another area that requires special consideration is the ability to properly control the temperature of those parts that contact the coating. 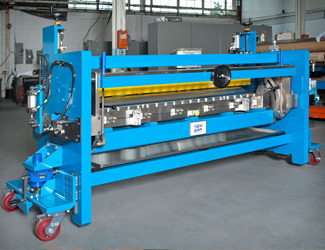 This includes parts such as the die coater’s die; the applicator roll, metering roll and coating board in roll coaters; the engraved roll, coating pan/trough and doctoring system in gravure coaters; and the knife blade, blade holder, coating backup board and backing roll in knife coaters. In addition to designing the parts that are heated to maintain the coating’s temperature, they must be designed to maintain the uniformity and consistency of the temperature since variations in the temperature will result in variations in the coating application rate. Special attention is required in the selection of lubricants for items such as bearings. Standard greases, which have maximum operating temperatures (at which they breakdown), may need to be replaced with high temperature alternatives. For systems that operate at very high temperatures, it may become necessary to incorporate a system that not only circulates lubricating oil but also cools it. An additional consideration for the proper design of a hot melt system is the cooling of the product after application. Though this is an extremely important topic, it is not covered by this article. As discussed above, there are many factors that go into the proper selection and design of a hot melt application system. Therefore, when considering a system, one should assure that the method chosen matches the application’s requirements and that the system is properly designed to operate under the required conditions. 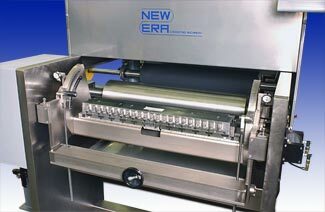 Tom Lombardo is Vice President of Engineering at New Era Converting Machinery. He has an extensive background in the design and operation of web converting equipment, having started in the industry in 1978. He is associated with several patents in the industry. Bob Pasquale is one of the founders and principals of New Era Converting Machinery, where he serves as President. He holds a degree in Mechanical Engineering from Stevens Institute of Technology and has worked in the web converting industry since 1985. He is the holder of several patents in the industry. *That concludes our blog series, “Methods and Design Considerations for the Application of Hot Melt Coatings.” Thank you for reading!